It’s true that being Paleo helps curve cravings once your body is attuned and receiving well-rounded nutrition, but sometimes you just miss certain not so Paleo-friendly dishes for all kinds of reasons. Pasta dishes are a prime example. After all, Alfredo, tomato-cream sauce, and garlic-parmesan sauce are absolutely delicious and pasta is a great vehicle to carry those flavors. The thing is, you don’t need the wheat pasta to enjoy a good sauce! 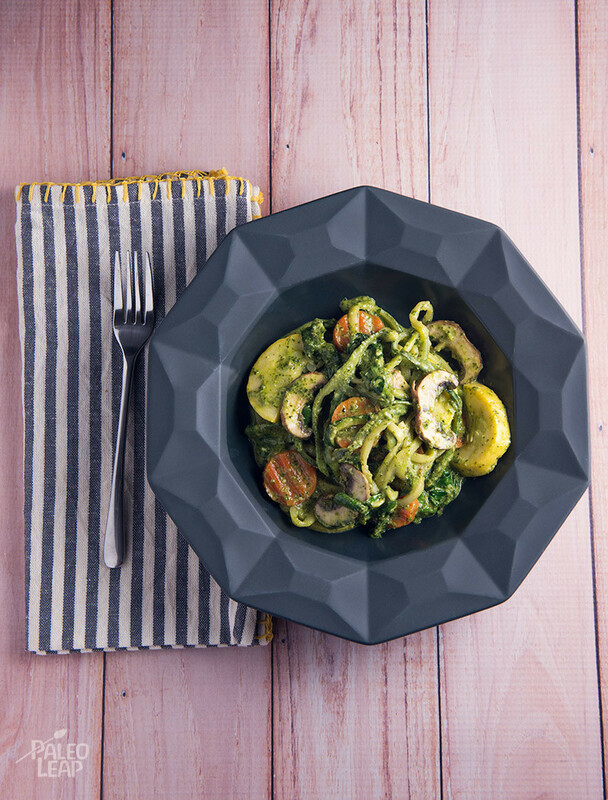 Here we created a twist on a classic Italian dish by letting a variety of vegetables be the vehicle for a creamy pesto sauce. It’s delicious and comforting with every bite. 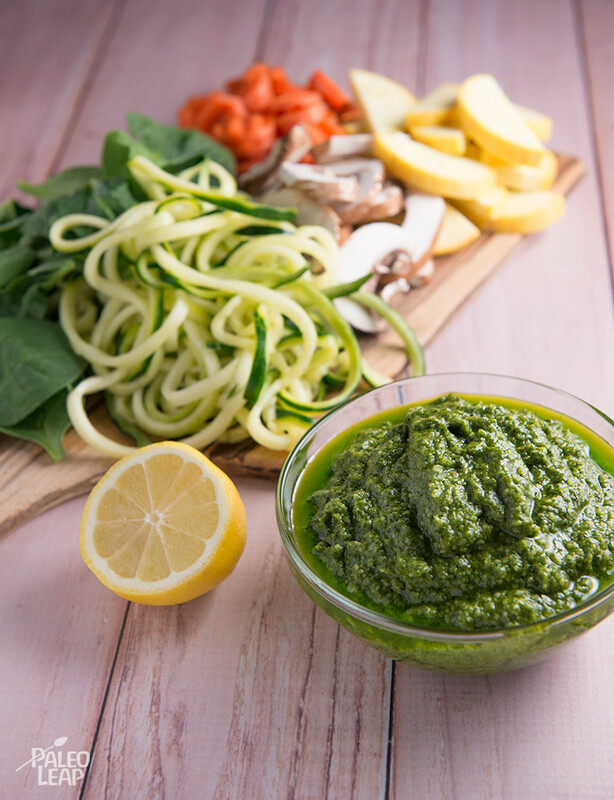 The vegetables we chose really lend themselves to the basil pesto, but really any vegetable can be used, so don’t be afraid to mix it up. Just be careful not to overcook whatever veggies you do choose. You’ll want them somewhat soft, but still with a good bite left to them so they withstand being mixed into the creamy sauce. This is a vegetarian dish, but you can easily add shrimp, chicken or any protein for that matter to make it into a full meal. We made zoodles out of the zucchini to play up the pasta theme, but you don’t have to. Then again, who doesn’t like to be able to nicely wrap-up their meal around a fork for a perfectly nestled bite or slurping up the zoodles as you would spaghetti? Two thumbs up if anyone reenacts Lady and the Tramp. SERVES: 4 PREP: 25 min. COOK: 20 min. Using a bamboo steamer, or any steamer of your choice, steam the carrots, mushrooms, yellow squash, and zucchini, if using sliced zucchini. This usually takes anywhere from 5-8 minutes depending on the method of steaming. Do not overcook; you don’t want them to become mushy once added to the sauce. If making zoodles, add them to a colander and sprinkle with salt, let them stand in the sink for at least 10 minutes to draw out some of the water. When ready, pat them dry with paper towels. While the vegetables are steaming, heat some cooking fat, coconut milk (start with a 1⁄2 cup), salt and pepper to taste over medium-high heat until boiling. Turn down the heat to medium and add in the pesto and lemon juice, stir until well incorporated. Taste, and adjust the seasoning or add additional coconut milk to your liking. Bring the sauce to a simmer and add the zoodles, if using, and gently mix with tongs, cook for 1 to 2 minutes. Next, add the spinach and cook until wilted. Add the remaining vegetables and gently mix. If you’d like, let the vegetables simmer in the sauce for a few minutes, just make sure they don’t overcook.